This is a book that I picked up on the recommendation of a couple of the more fantasy-oriented book blogs that I follow. I've been a fan of fantasy for a long time, so I decided that it deserved at least a look. I'm glad that I picked it up. 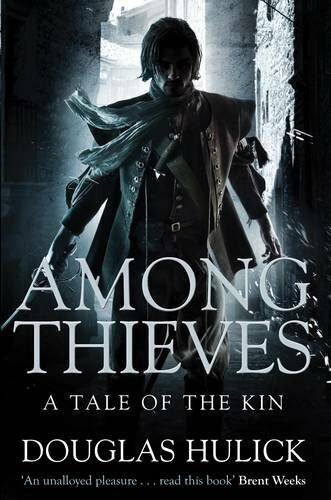 Among Thieves follows a thief by the name of Drothe who makes a living by digging up and selling information about events in the city of Ildrecca to his boss' organisation, as well as a little bit of smuggling on the side. It is during one of these smuggling ventures that he finds himself involved more than he would like in the search for a particular imperial relic that could tear his world apart, with his best friend, the mercenary Degan, getting dragged along with him. At first, this reminded me a lot of the Dungeons & Dragons campaigns that I've been a part of in the past. The steady rise from bit part to major player, the irreverent humour between characters, the conflict of these same characters' own private agendas and the slightly more Machiavellian tactics were all too familiar to me. The point where this comparison splits is that the amount of allegiance switches and double-crossing present in Among Thieves would be more than enough to lead to party splits in D&D (trust me, I know that all too well as well). I guess the similarity here is very much a personal thing, but I couldn't help but like this book because of the associations with close friends that D&D has for me. In terms of plot, other than the D&D thing that I mentioned above, it has all the things that I love about fantasy. First, the opportunity for subterfuge and the equal importance that is placed on a warrior's brawn and a rogue's brains and subtlety; when your protagonist is constantly outgunned, yet still manages to pull through by the skin of his teeth, I can't help but feel thrilled. Second, there's the setting. Ildrecca is your standard fantasy "hive of scum and villainy" sort of city, but Hulick just seems so invested in this place that the enthusiasm sort of catches. In any case, there are a few features that are really interesting that I think will come to play later, should there be any further instalments (something I would be willing to bet money on); the main point that caught my eye was that of the empire itself. The empire is ruled by three incarnations of the same man, all of whom are promptly reborn after they die, purportedly caused by the holy will of angels; unfortunately, in more recent years, the emperors have been going crazy and paranoid in their old age, the onset of which seems to be happening quicker and quicker as the generations go by. While there is some intriguing information that comes out about these reincarnating emperors, they don't really play that big a part in this instalment, something that I hope will be remedied later on. My only real gripe was that with so much subterfuge going on, there is no real climax moment; instead, there are mini-climaxes as Drothe resolves each of his problems in turn, so it can feel a bit like the book just sort of petering out. In terms of characters, I think that they were perhaps a bit simplistic, but they still worked. Drothe is the honourable thief, who is ultimately going to try and spare his own skin, but will still try and do the right thing along the way. Likewise, Degan is the best friend who happens to be a mercenary; he'll cover you in the most dire of situations, but at the same time he has his secrets and his own agenda that may or may not impact your own goals. Basically, the characters fill a role, and for the most part they fill it well and actually managed to muster a fair bit of emotional attachment for me; whilst I enjoyed A Game of Thrones, I must concede that Among Thieves has it beaten in regards to the emotional attachment. Next review: The Mall by S. L. Grey.